Klimt beads are inspired by the Austrian symbolist painter, a member of the art nouveau movement and particularly by his "Golden Phase" where many of his paintings utilized gold leaf. Klimt traveled to Venice where the gold mosaics were said to have influenced these works. 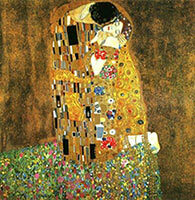 We use the bright colors and gold leaf or silver leaf in all Klimt inspired beads. The bright colors of the small pieces of authentic Murano Glass against the background of .925 Sterling Silver Foil or 24kt Gold Foil make for a beautiful bead, and even more impressive jewelry.